The Manitoba Reading Association (MRA) is a provincial council of the International Literacy Association. As a non-profit organization run by volunteers consisting of teachers, librarians, students, and parents, we are committed to the promotion of literacy and to the improvement of literacy instruction throughout Manitoba. Furthermore, MRA supports Manitoba's local reading councils. Provide inservice opportunities for educators, parents, students, etc. Network with other literacy organizations throughout the province. Evaluate current and future instructional practises in the areas of literacy. Sponsor an international literacy project annually: We have a three-year commitment to support one student through the Volcanes Community Education Project. Support the International Literacy Association (ILA) by publicizing its worldwide literacy activities and by promoting its extensive selection of publications and brochures. MRA organized the successful 4th Adolescent Literacy Summit on April 12 and 13, 2017 in Winnipeg. We hosted internationally renowned literacy leaders, along with Canadian and Manitoban authors. Manitoba educators were also included in the program, and we continued to showcase the achievements here at home. For the first time, the Summit also included a student panel. MRA supports executive members to attend the International Literacy Association's Annual Conference and Exhibits. This allows our members to keep informed and connected to the most current research in the field. MRA has continued to build a strong presence on social media, networking educators across the province and beyond. We host Twitter chats and have regular book draws. We appreciate donations from publishers and authors. Our volunteer executive is represented by urban, rural, and northern members and each has a wealth of experience and skill. We strive to find new ways to innovative and to support our Manitoba educators, parents, and students. We have held meeting and sessions in the Millennium Library and the Canadian Museum for Human Rights. MRA supports the work of four member councils in the province. 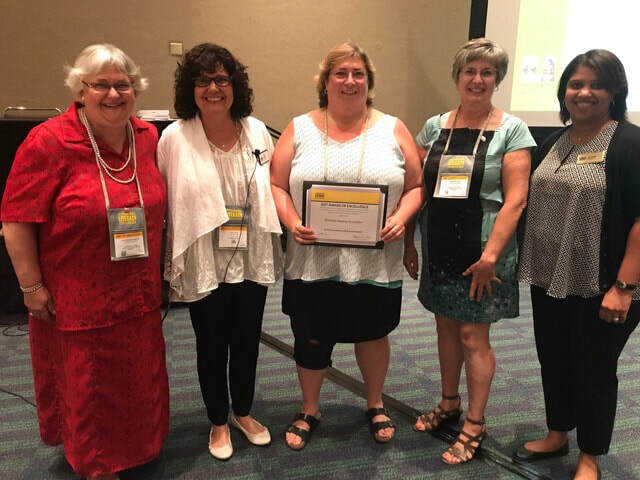 Accepting the ILA Award of Excellence at the 2017 ILA Annual Conference (L-R: Carol Hryniuk-Adamov, Former Provincial Co-ordinator; Lori DiGisi, ILA Board; Arlene Kinden, MRA Treasurer; Tiffany Sears, ILA; Barbara Lepp, Provincial Coordinator). Click here to contact the Manitoba Reading Association, or reach out on Twitter.